The Digifant 1 ecu uses closed loop lambda control for computing the injection amount at idle and part throttle (regulation to lambda 1). At full throttle (WOT, wide open throttle), the engine has to run richer than lambda 1 to produce more power / torque and to keep the temperature in the combustion chamer in a safe area. This WOT enrichment is achieved by deactivating the lambda control and computing the injected fuel out of the map data (open loop). The firmware of the digifant ecu (program code) contains a "feature" which delays the reaction on pressing the WOT switch for 3-4 seconds. 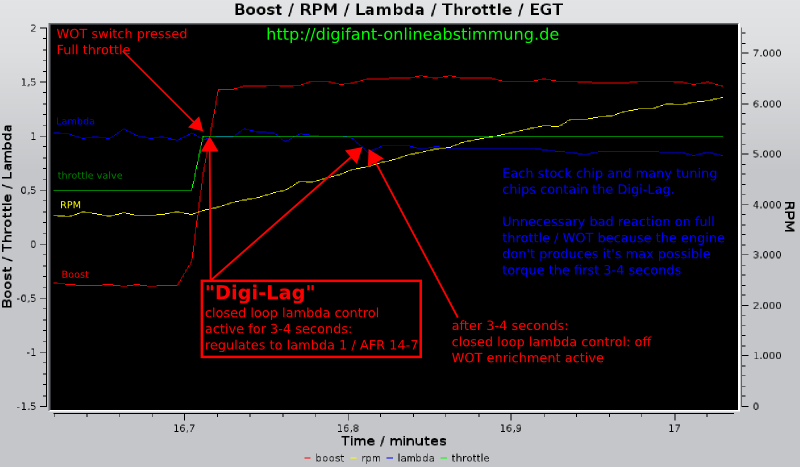 The closed loop lambda control is still active (and regulates to lambda 1) for the first 3-4 seconds on WOT. This "feature" is called "Digi-Lag". It leads to a poor reaction on flooring the gas pedal (gasoline engine produces it's maximum torque around lambda 0.85 - 0.9 and not at lamda 1!). All factory chips and many tuning chips contain the Digi-Lag! 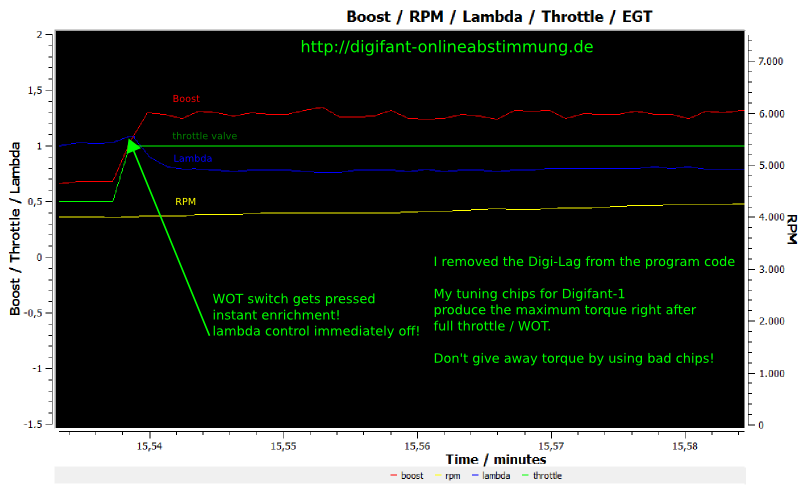 I changed the program code to get instant WOT enrichment and succeeded in completely removing the "digi-lag"! Beyond that, I'm able to activate the WOT open-loop (WOT enrichment) on part throttle based on a boost threshold (i.e. activate WOT-enrichment if boost >= 0.8 bar / 11 psi). Some nice graphs to get the point better.